Brazil’s growth forecast for 2015 has followed an uninterrupted downward trend this year, dragged down by political turmoil and poor economic data. In January, analysts surveyed by FocusEconomics expected that the economy would grow in 2015, forecasting a 0.5% expansion. This forecast was largely on the back of less weak economic data emerging from the country and relative optimism that things would improve in 2015. Over the next couple months, panelists revised their forecasts down as worse data began emerging from Latin America’s largest economy and President Dilma Rousseff came under increasing pressure in Congress over the Petrobras scandal. Moreover, the country was experiencing a severe drought affecting agricultural production and low commodity prices were weighing on export revenues. In addition, Brazil’s economy returned to contraction in the first quarter of 2015, after two consecutive quarters of growth, and freshly-passed austerity measures were expected to dampen private consumption throughout the year. As a result, by June, the FocusEconomics panel had revised down drastically their forecasts and saw a 1.2% contraction for 2015. 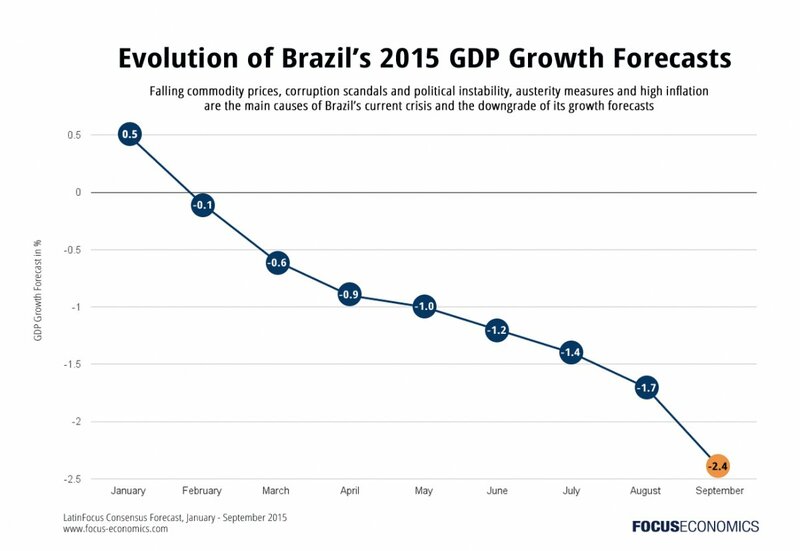 The rapid decline continued over the summer months and by September, the FocusEconomics panel saw Brazil’s economy plummeting 2.4% for 2015. Austerity measures, high inflation and depressed confidence had combined to cause panelists to see the economy recording its largest contraction since 1990. Moreover, for the first time in its modern history, the government had presented a budget with a primary deficit to Congress on 31 August, highlighting the country’s shaky financial situation. 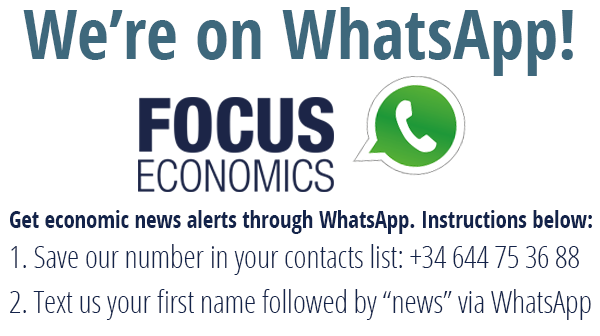 For 2016, analysts surveyed by FocusEconomics see the economy remaining in contraction territory and falling 0.3%. Yet the country’s circumstances are deteriorating so rapidly, the forecast could be revised down even further in the coming months.